Situated at the highest point of the town of Monforte de Lemos, enjoying excellent views of the regional capital, is the San Vicente do Pino collection of buildings. It comprises the Keep, the San Vicente do Pino Monastery and the Condes de Lemos Palace; the latter two house the Parador Monforte de Lemos. The original monastery goes back to the 9th century and the current building, which stands on its site, is neo-classical and dates from the 17th century. 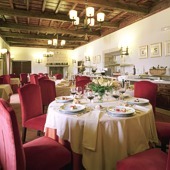 The building has been restored and converted into a Parador with 50 rooms distributed around the central cloister. There is also an annex building called the “Casa del Monte Fuerte” with a capacity for 100 guests. The cloister of finely-worked stone has an interesting layout of slopes and curved channels in the central floor that were used to collect rain water which was then stored in a cistern beneath the floor. The 16th century Condes de Lemos Palace, located opposite the monastery, was damaged by fire and then restored in the 18th century. Today, the palace houses the Parador’s three magnificent function rooms and a 300 capacity banquet room. All the rooms in the Palace have impressive chestnut coffered ceilings. Some of the highlights of the local gastronomy include the medieval brochettes of sirloin steak, cod with braised onions, beef "O Caldeiro" from "A Limia" and roast suckling pig in the style of the Counts of Lemos. Hunting and fishing are two activities common to the region, and game is often on the menu. Besides local and international dishes there is also a special menu for those on a gluten free diet..
Other local activities are golf, trekking, canoeing, rafting and other water sports. The regional festivals are worth visiting. The Empanada and Lamprey festival takes place the last Sunday of August. On 21st September San Mateo is celebrated and from the 12th to the 16th August there are festivities in honour of the town’s patron saint, La Virgen de Montserrat. On 3rd February there is the festival of San Blas while San Lorenzo is remembered on the Sunday before Holy Week. There are a number of interesting excursions in the area. Follow the local Romanesque routes through Monforte, Sóber, Proendos, Pinon, Cadeiras and Lobios. The route of the monasteries is also fascinating as is the “Way of St James”. Take a trip in the rias on a catamaran and explore the Ribera Sacra region. The Monforte de Lemos Parador has fifty rooms divided into thirty seven twins, five doubles, four suites, three duplexes and one easy access room all with an ensuite bathroom. They also have a minibar, air conditioning, television, safe and telephone. Other facilities of the hotel include currency exchange, free internet access in communal areas, central heating, garden, garage and parking (without security and limited places) and conference facilities. 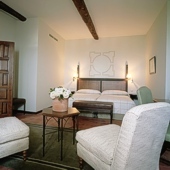 In addition to the standard hotel services such as restaurant (Gastrobar), bar, function rooms and confereence facilities, the Parador of Monforte de Lemos features a gymnasium, jacuzzi and seasonal swimming pool. Distance from the nearest airport is approximately 125 kms, train station is 1 km away and the nearest port is 136 kms away. Meals are served at the 'Gastrobar' with an informal but complete offer. Breakfast and event services will still be served at the Parador. Pets are not allowed in the luxury hotels in the Spanish Paradores group. As in Santiago, no offers to help with luggage were forthcoming so I soldiered on and transported everything in the tiny lift. Rooms were very small and gloomy. Dining room uninspiring for dinner but breakfast was good. Car park can get very full if there is a service in the church - there seemed to be one nearly every day. Courtyard area could be improved by not letting children play there whilst their parents are chatting in the bar - the noise was intolerable. Altogether excellent. We had a very happy time here. Two weeks in northern Spain=picturesque, fascinating, best vacation we have EVER had. We stayed at 10 different paradors (Siguenza, Fresneda Bernardo, Argomaniz, Santillana del Mar, Lerma, Leon, Monforte de Lemos, Cambados, Verin, Benavente, and Tordesillas) , each of them beautiful and luxurious. We hated to leave and return to America. Can't wait to visit again, and we would only stay in the paradores, nothing rivals them. If I could arrange it, I would move to Spain in a heartbeat. I am working on my plans to do just that. 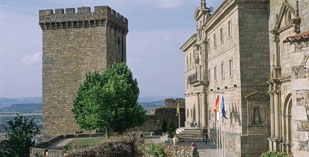 Parador de Monforte de Lemos is in a old palace overlooking the town.